FERC got around to posting that online and sending an alert to ecomment subscribers today, two weeks later. You or your group can now file as an intervenor for FSC under the new docket CP14-554-000. Or you can ecomment under that docket. 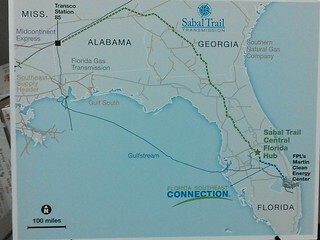 Sabal Trail and Transco have not yet filed for formal permitting, but Sabal Trail has repeatedly said it plans to do so 31 October 2014. Here’s HTML of that notice letter. Search for CP14-554-000 in FERC’s General Search and you’ll find a large number of PDF and other files, many marked “Availability: Privileged”, as in this pipeline or Sabal Trail or Transco may gouge through your back yard or under your river, going right to three already-authorized LNG export operations in Florida, but you don’t get to see FPL’s rationalizations for why. Maybe if those rationalizations were public, they’d stink even more. To get alerts on the formal filing, you’ll need to log in (or register first) with FERC and subscribe to docket CP14-554. Take notice that on September 26, 2014, Florida Southeast Connection, LLC (FSC), 700 Universe Boulevard, Juno Beach, FL 33408, filed an application under section 7(c) of the Natural Gas Act and Parts 157 and 284 of the Commission’s regulations requesting authorization to construct, own and operate a new natural gas pipeline system (FSC Project) consisting of approximately 126 miles of pipe, associated valves, piping, and appurtenant facilities, commencing at an interconnection with the proposed Sabal Trail Transmission, LLC (Sabal Trail) pipeline near Intercession City, Florida, and terminating at a delivery point at the Florida Power & Light Company (FPL) Martin Clean Energy Center (Martin), near Indiantown, Florida. FSC will have an initial transportation capacity of 640,000 dekatherms per day. In addition, FSC requests that the Commission issue to FSC a blanket certificate authorizing FSC to construct, operate, and abandon certain facilities under Part 157, Subpart F of the Commission’s regulations, a blanket certificate authorizing FSC to transport natural gas, on an open access and self-implementing basis, under Part 284, Subpart G of the Commission’s regulations, and authorizations necessary to charge initial recourse rates for certain services to be rendered by FSC, all as more fully set forth in the application which is on file with the Commission and open for public inspection. The filing may also be viewed on the web at http://www.ferc.gov using the “eLibrary” link. Enter the docket number excluding the last three digits in the docket number field to access the document. For assistance, please contact FERC at FERCOnlineSupport@ferc.gov or toll free at (866) 208-3676, or TTY, (202) 502-8659. Any questions regarding the proposed project should be directed to Robert E. Sharra, Director Business Development, Florida Southeast Connection, LLC, 700 Universe Boulevard, Juno Beach, Florida 33408, or by calling (561) 691-7274 (telephone) or (561) 304-5233 (fax) or email at robert.sharra@nee.com. On October 16, 2013, the Commission staff granted FSC’s request to utilize the National Environmental Policy Act (NEPA) Pre-Filing Process and assigned Docket No. PF14-2-000 to staff activities involving the project. Now, as of the filing of this application on September 26, 2014, the NEPA Pre-Filing Process for this project has ended. From this time forward, this proceeding will be conducted in Docket No. CP14-554-000, as noted in the caption of this Notice. Because the environmental review of the FSC Project must also include both Sabal Trail (currently in the NEPA Pre-Filing Process under Docket No. PF14-1-000) and Transcontinental Gas Pipe Line Company LLC’s Hillabee Expansion Project (currently in the NEPA Pre-Filing Process under Docket No. PF14-6-000), the Commission cannot begin preparation of the Environmental Impact Statement (EIS) to comply with the NEPA of 1969, until after both remaining applications are filed. Within 90 days after the Commission issues a Notice of Application for the final received application, the Commission staff will issue a Notice of Schedule for Environmental Review that will indicate the anticipated date for the Commission’s staff issuance of the final EIS analyzing all three proposals. The issuance of a Notice of Schedule for Environmental Review will also serve to notify federal and state agencies of the timing for the completion of all necessary reviews, and the subsequent need to complete all federal authorizations within 90 days of the date of issuance of the Commission staff’s final EIS. There are two ways to become involved in the Commission’s review of this project. First, any person wishing to obtain legal status by becoming a party to the proceedings for this project should, on or before the comment date stated below, file with the Federal Energy Regulatory Commission, 888 First Street, NE, Washington, DC 20426, a motion to intervene in accordance with the requirements of the Commission’s Rules of Practice and Procedure (18 CFR 385.214 or 385.211) and the Regulations under the NGA (18 CFR 157.10). A person obtaining party status will be placed on the service list maintained by the Secretary of the Commission and will receive copies of all documents filed by the applicant and by all other parties. A party must submit 7 copies of filings made with the Commission and must mail a copy to the applicant and to every other party in the proceeding. Only parties to the proceeding can ask for court review of Commission orders in the proceeding. However, a person does not have to intervene in order to have comments considered. The second way to participate is by filing with the Secretary of the Commission, as soon as possible, an original and two copies of comments in support of or in opposition to this project. The Commission will consider these comments in determining the appropriate action to be taken, but the filing of a comment alone will not serve to make the filer a party to the proceeding. The Commission’s rules require that persons filing comments in opposition to the project provide copies of their protests only to the party or parties directly involved in the protest. Persons who wish to comment only on the environmental review of this project should submit an original and two copies of their comments to the Secretary of the Commission. Environmental commenters will be placed on the Commission’s environmental mailing list, will receive copies of the environmental documents, and will be notified of meetings associated with the Commission’s environmental review process. Environmental commenters will not be required to serve copies of filed documents on all other parties. However, the non-party commenters will not receive copies of all documents filed by other parties or issued by the Commission (except for the mailing of environmental documents issued by the Commission) and will not have the right to seek court review of the Commission’s final order. The Commission strongly encourages electronic filings of comments, protests and interventions in lieu of paper using the “eFiling” link at http://www.ferc.gov. Persons unable to file electronically should submit an original and 5 copies of the protest or intervention to the Federal Energy regulatory Commission, 888 First Street, NE, Washington, DC 20426. Comment Date: October 31, 2014.